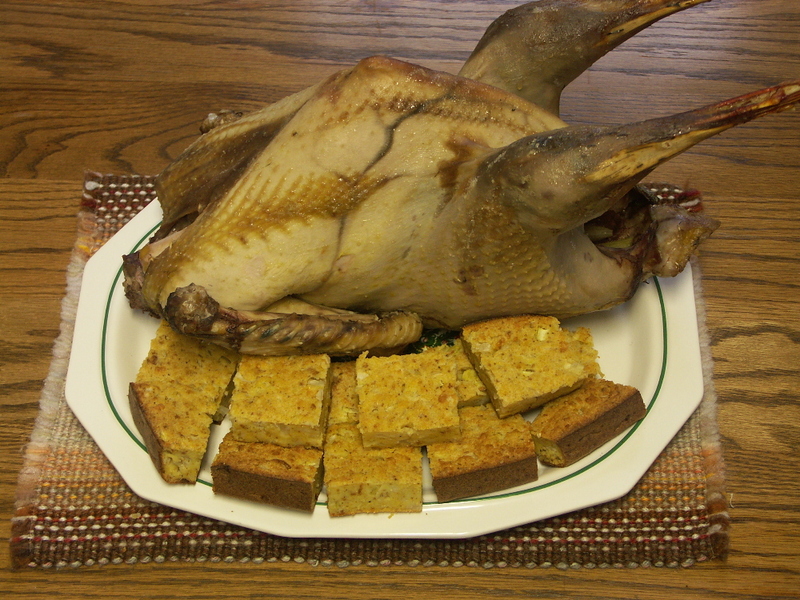 Wild turkey with cornbread dressing on a Christmas platter. The centerpiece of the holiday meal. 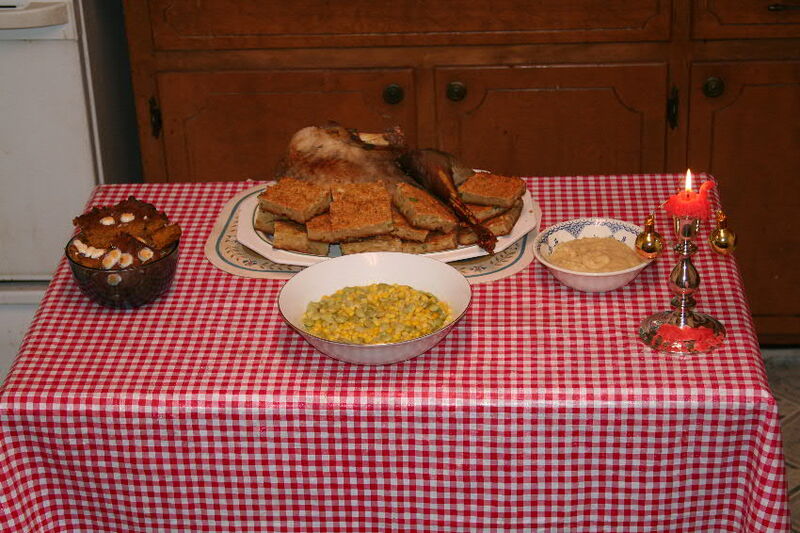 The large Christmas meal is a once-a-year event and very often its preparation is staged over a period of days prior to the climatic family feed. With my own now-reduced family, I do four days of Christmas-related cooking starting with cooking the breads that are going to be used for my cornbread dressing and ending with the last pots being put on the stove and the dressing cooked on Christmas day. In 2011, I recorded a series of YouTube videos describing as many of each day’s activities as I could put in four short-form YouTube videos and concluded with a video on making turkey soup from the left-overs. This series is Parts 1-4 of “Four Days of Christmas Cooking.” Being a diabetic and unfortunately sharing this condition with some other family members, I do not do cook the sweets, cookies, pies and cakes typical of many families’ Christmas celebrations. About as sweet as I get is a sweet potato souffle’ which has raisins and artificial sweetener with a few real marshmallows on top. The short-format media exhibited some constraints. On Part 2 where I actually cook the souffle’, my Flip camera ran out of memory and the actual mixing of the dish was not recorded. To compensate, I have written out the recipe below. Hoecake and eggbread for dressing. This video may be viewed on YouTube at: http://youtu.be/7-RxOrMtgAQ. The others will be similarly posted as they are produced. Souffle', chopped products and turkey. Part 2. “Sweet Potato Souffle’ and Chopping.” On day two of this four-day cooking cycle, the wild turkey (goose or swan) is taken out to start to thaw in preparation to cooking the next day, and I make the Sweet Potato Souffle’. This dish will keep very well under refrigeration and has marshmallows put on top of it when it is re-warmed prior to serving. I also chop up the nuts for the souffle’ as well as the onions and celery that will go into the dressing and boil the eggs that I will use in the giblet gravy and potato salad. On this video I also discuss pairing knives and a common type of Japanese cooking knife that was made for me by Master Bladesmith Murray Carter. Carter has just published a book “Bladesmithing with Murray Carter.” In this book he describes how he became the 17th generation owner of a Japanese knife-making company following a hands-on apprenticeship in rural Japan that lasted over a decade. He has now moved to Hillsboro, Oregon, where he has his shop and also teaches Japanese blade-making techniques. He also hand-forges traditional Japanese-style, and other, knives for the world market using some tools that are centuries old. Carter is also producing a video series about Japanese cooking knives, how he hand forges them, their uses, sharpening and long-term care. His products may be viewed on his webpage, www.CarterCutlery.com and inquiries made to murray@cartercutlery.com or by telephone to him at (503) 447-1029. This video may be viewed at: http://www.youtube.com/watch?v=AisWaf9zSsQ by clicking on this link. 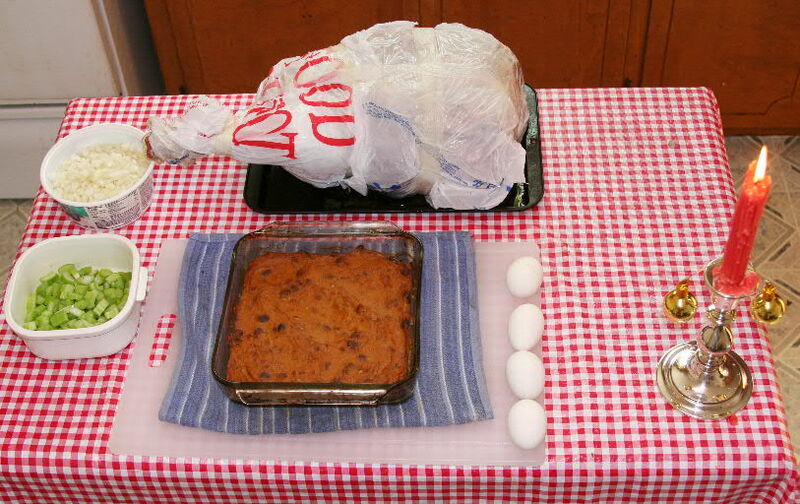 5 pounds of sweet potatoes, boiled and drained, 6 medium eggs, 1 1/2 cups of raisins, 1 1/2 cups of finely chopped pecans (or other nuts), 1/3 cup of margarine, 1/4 cup of sugar substitute, 1 teaspoon of vanilla extract, 1/4 teaspoon of cinnamon, 1/4 teaspoon of nutmeg, 20 small marshmallows. Place drained hot sweep potatoes and place in large bowl. Quickly add and stir in butter, eggs and other ingredients. When egg whites have turned white, taste and adjust sugar, raisin and nut content as desired. Do not over sweeten as the product will become sweeter as it looses moisture during cooking. Pour into greased oven-proof ceramic or glass dishes in a layer about 1 1/2-inches thick. Place in oven at 350 degrees and cook until firm and the product starts to pull away from the edges of the container – about 20 minutes. Sprinkle marshmallows on top prior to re-warming on Christmas day. Wild turkey and recovered stock or "drippings" for turkey dressing to be made on Christmas Day. Part 3. Cooking a Wild Turkey. Cooking the turkey provides not only the meat for the holiday dinner, but also the stock, or drippings, that are needed for making the dressing the following day. Cook the turkey in a pan to which water has been added, cover the bird with aluminum foil and crimp the top and sides to make as steam-tight a tent as possible. As the bird was pre-thawed, the cooking time for this one was a bit over two hours. The fowl is cooked to somewhere between the point that the legs can freely wiggle to they fall off at the touch. The drippings need to be carefully removed from the roasting pan (They will badly burn skin and make a terrible, slick mess on the kitchen floor.) and at least a quart preserved for use in the cornbread dressing. 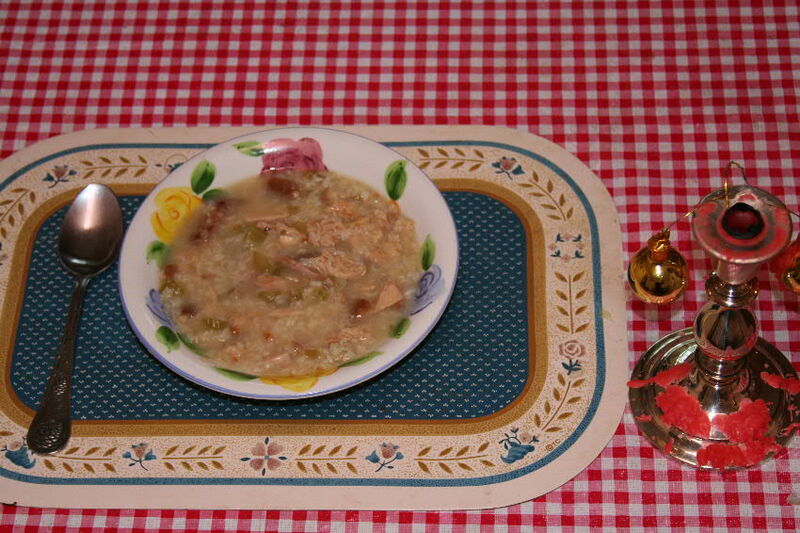 The cooked onions and celery may be diced for use in a post-Christmas turkey soup or meat-rich hash. 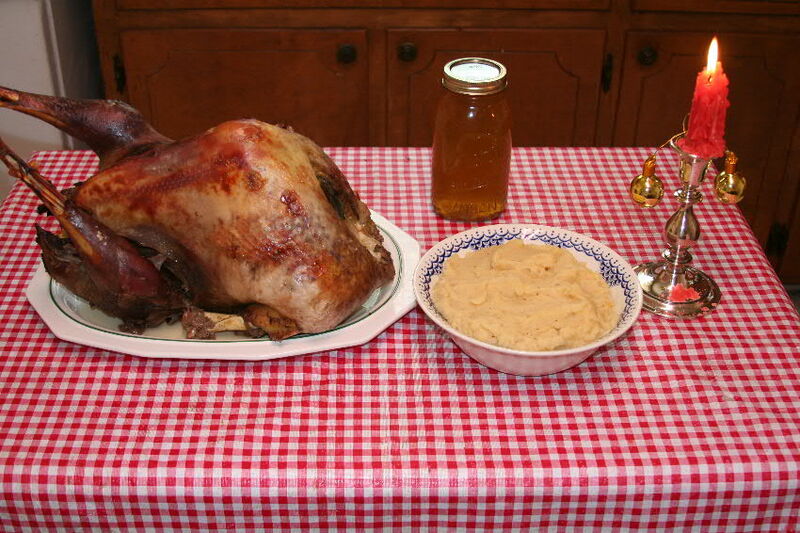 The video on turkey roasting is available at: http://youtu.be/WmCm5eVNb4Y. 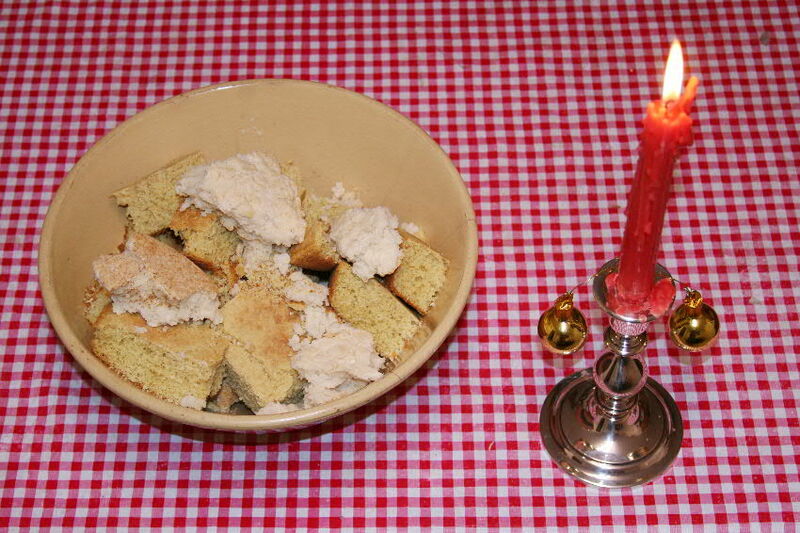 A sample of wild turkey, vegetables and cornbread dressing served on Christmas Day. The video of the last day’s events may be viewed at: http://www.youtube.com/watch?v=hr69gzDAFeo. Although not originally a part of this series, I also produced a video on making turkey soup from the leftover turkey meat, rice and unused chopped up onion and celery. This can be seen at: http://www.youtube.com/watch?v=_KVM9TZkMzE. The final product of the Christmas meal is a tasty soup made from the wild turkey carcass and trimmings with the addition of left-overs from the Christmas meal. The complete recipes for cooking wild turkey and dressing are found in my books, Backyard Deer Hunting: Converting deer to dinner for pennies per pound and Crossbow Hunting along with many others. These books may be seen at www.hoveysmith.com and purchased through the website or from any on-line bookseller. Repairs were made to the Tree Lounge "Ground Lounge" (folded in foreground) and the "Elusive Whitetail" climbing stand that was also made by Tree Lounge (background). “O crap!” was what I thought when I felt the rear wheel of my truck run over something as I backed out from under my parking shelter. I knew that nothing good had happened. I had just run over one part of my “Ground Lounge” Tree Lounge deer stand. I moved it off to the side and then went to my dentist appointment. What was particularly bad about this was that now that Tree Lounge is no longer in business, there was no chance for me to get a new stand or replacement parts. As any pioneer, farmer, tinkerer or shade-tree mechanic knows, such an event is not necessarily an “epic failure.” Somehow, someway, I was going to take what I had around the house and repair this stand. 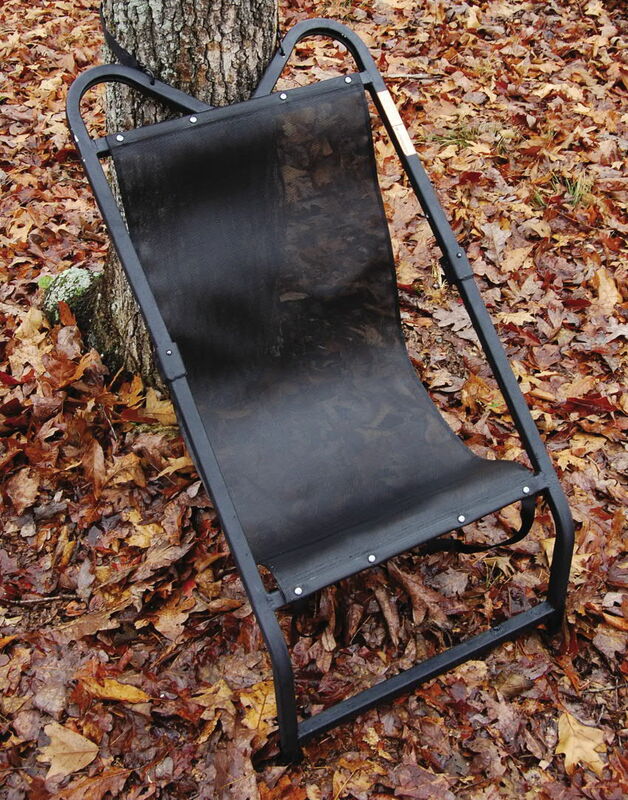 The “Ground Lounge” is a prop-up-against-the-tree type of stand that is lightweight and particularly handy for turkey and deer hunting. It gets the hunter off the ground in a more comfortable position (although I use a cushion in it too) out of the wet or snow. Factory-made version of the Tree Lounge “Ground Lounge.” This stand used the same aluminum tubing and seat material of the more common Tree Lounge climbing stand. My version was slightly different in that it did not have the rounded curves at the top of the stand. 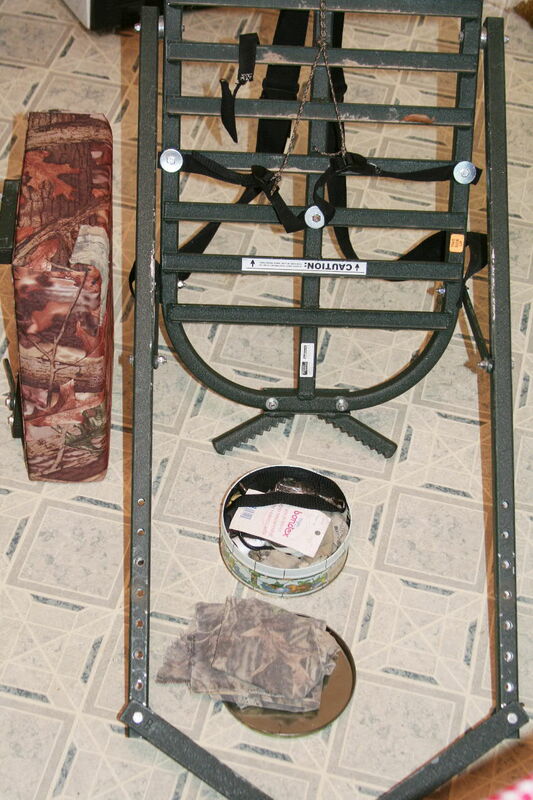 Materials used to fix nylon strap and seat. On examination, what I found was that one arm of the stand was badly bent, another slightly bent and the welds were broken on the hinges that connected the upper and lower parts of the stand. 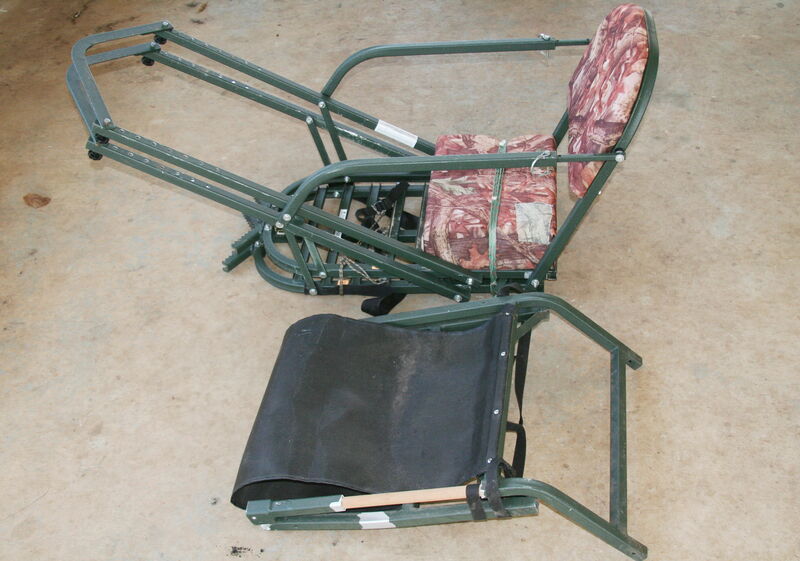 The seat and other limbs of the stand were intact, except for the broken welds. I did not have a welding outfit, but I did have an assortment of small power tools, files and a bucket full of miscellaneous bolts, screws, washers, etc. that I had collected over the decades. I am more a “wood guy” that a “metal guy,” so I had a small wood-workers vise and some 1-inch tomato stakes. The concept was to cut out the badly bent portion of the limb, replace it with a section of wooden stake; and then use nuts and bolts to re-establish the functionality of the hinges. 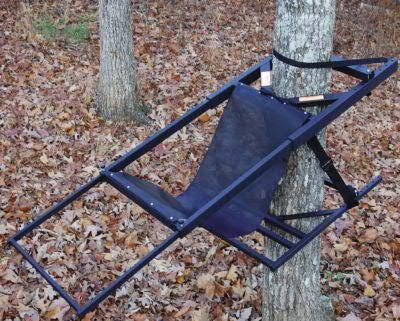 As it turned out, not only did my “Ground Lounge” need help, but rodents had also chewed a foot strap from my “Elusive Whitetail” climbing stand, that was also made by Tree Lounge. This was a simple matter of fitting and attaching a new nylon strap and a bit of cord so that I could pull both foot straps up to slip my boots under them. The rodents had also taken hunks out of the seat and gnawed through the fabric in several places. I had already repaired the climbing stand and shot a video of the experience. My repairs on the “Ground Lounge” would provide sufficient new materials to include a second type of Tree Lounge stand in the video. The approaches that I used to fix these stands is not necessarily the best possible repair. I would hope that those with access to welding equipment, tube fabrication technology, a wider assortment of metal “junk” and a machine shop could, and would, do a better job of repairing the “Ground Lounge” that I did. One thing that I found almost enjoyable is that the American-made versions of the Tree Lounge stands used English-standard dimensions. So if you are going to work on either a traditional “Tree Lounge” climbing stand, the “Ground Lounge” or “Ladder Lounge” dust off your old set of socket and hand wrenches and use these. I suspect that the Chinese versions with the D-shaped tubes use metric components. As a measure of economy, Tree Lounge stuck with one size of 1-inch square aluminum tubing for their stands, so far as I have seen. This is handy because replacing broken or bent segments can be made with 1-inch outside dimension steel tubing or pipe or the wooden tomato stake that I employed. I dressed the tubing smooth with files or a Dremel Tool to remove the sharp edges and lumps of aluminum weld that interfered with the smooth fit of the parts. As I used a nut and bolt to reconnect the hinges to the limbs, I had to remove metal from inside the tubing to allow for the bolts to clear. There was sufficient clearance that the slightly bent limb was left “as is” because it did not interfere with the stand, which is always going to be used on less that perfectly level surfaces anyway. So, the minor difference in limb lengths cause by the bend is not significant. The repairs that I did using expedient materials worked, and importantly in this economy, was accomplished without any cost, or a round trip to town for parts. A good-looking repair? No it is not, but the deer and turkey I take using this stand will never know the difference. It will get the job done. As no new Tree Lounge stands are likely to be available in the forseeable future, repairing those that you already own is the best way to keep these excellent stands in use. The seats and straps are the usual parts that fail. The nylon fabric used in these seats is similar to “filter cloth” used in the paper and clay-minerals processing industries. Canvas may be used for seats, but this will have to be replaced more often and is not nearly as weather resistant as nylon or other polymer-based fabrics. 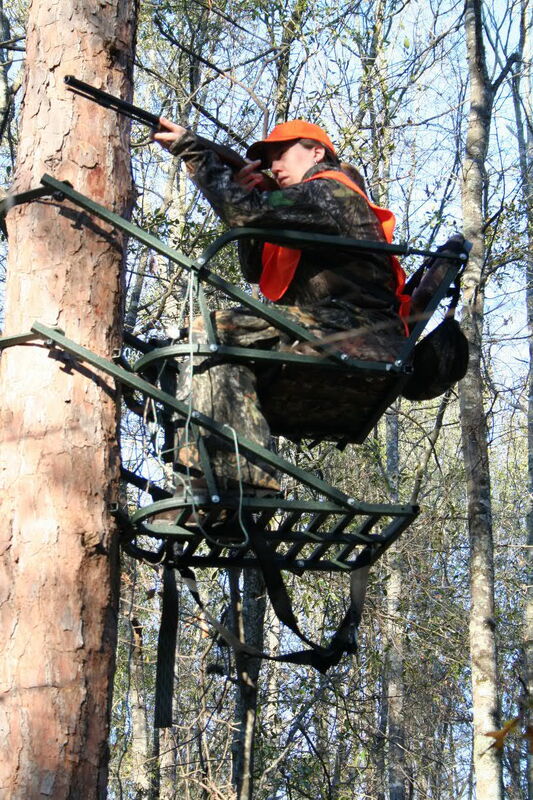 To extend the life of these stands, keep them out of sunlight and do not leave them in the woods all year. If given only a tiny amount of care, these stands will last for decades. 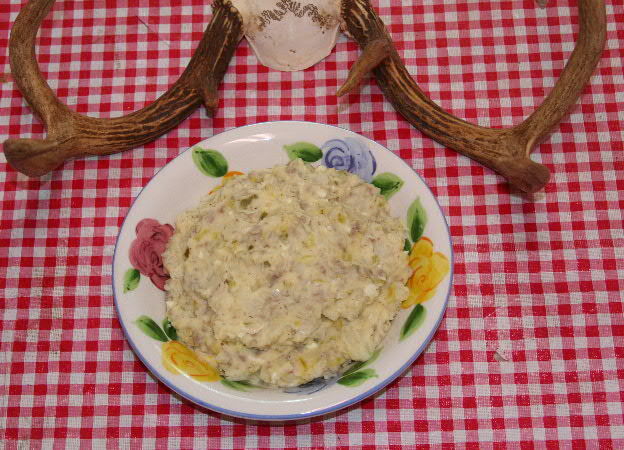 Dill Deer Potato Salad uses a mild homemade Italian deer sausage and dill weed to make an outstanding potato salad. Potato salads can be terrible. The worst are made with bland potatoes and too much mayonnaise and are like salty, lumpy library paste. Many of those shipped into chain restaurants in 5-gallon pails fall into this category. If you are going to make an outstanding potato salad start with potatoes that have some taste. The best that I have found are smallish potatoes from Ontario. These are oblong and about 2-3 inches long. They were called, and labeled in French, as Earth Apples. They were crisp, very slightly sweet and relatively easy to peel and cook. Unusual features in my potato salad is I mix Italian-flavored mild deer sausage in mine along with the addition of dill weed. The sausage is fried, granulated and cooled before adding to the salad. Towards the final stages of mixing I add about half a teaspoon of dill weed to 2-pounds of boiled potatoes and 1 1/2-pound of dry granulated deer sausage. I do this as I adjust seasonings and put in additional salt and pepper as needed. I prefer a light coating of mayonnaise on all of the products and the final mix is quite stiff with all of the ingredients being fully visible. The mix of sweet/vinegar/peppers/boiled egg/onions with the deer meat gives an interesting complexity to the dish and converts it into a one-pot meal if desired. Serve this with buttered rye bread and a Burgundy wine and you can have the makings of a memorable meal from a dish that is all to often an industrialized product and taste like it. Be brave. Experiment with your potato salad by adding sausage, other meats, flavored vinegars and other products to come up with a product that is worth eating. I use wild-game sausages that I make from wild hogs, deer and geese. An Italian sausage from your grocery store would be a good start. Just pre-cook, drain off any liberated fat and cool before adding the meat to the potato salad. There is also no reason that salmon would not work or even canned tuna, if nothing better was available. I have a YouTube video “Best Dill Deer Potato Salad” that illustrates the making of a potato salad that was served as part of a pre-Christmas family event. The filming was done by Amber, my 12-year old niece, who has the makings of a budding film maker. She caught on very quickly to framing, composition, following action and capturing key parts of the salad making process to make the 9-minute video. The clicks and snaps that you hear are from the tripod. This is a reasonably heavy tripod that is fine for still photography, but too noisy for use with a video camera that also records sound. Next time I will use a quieter tripod or discover how to lubricate this one. Watch the video at: http://youtu.be/s_47cetZWV4 if you have any difficulty in viewing it here.